Late last year Bizink’s website development team launched a stunning new website for JN CPA & Advisors! This firm is based in beautiful San Juan, Puerto Rico. The firm was founded by Jose Javier Negron Colon who chose amazing powerful local images and bold colours to ensure the new site stood out. 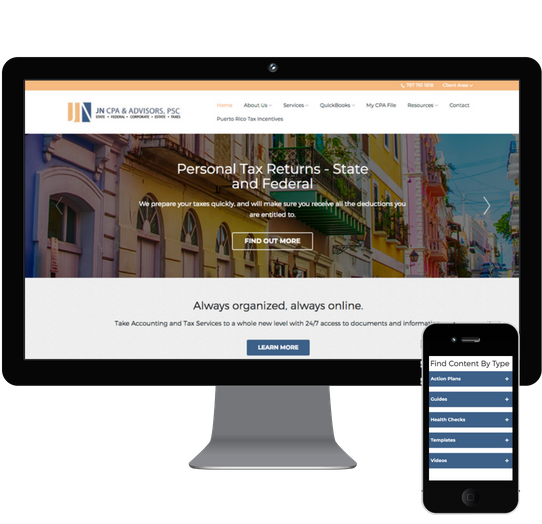 JN CPA & Advisors launched their new website shortly after Puerto Rico bore the brunt of Hurricane Maria. This disaster caused havoc and devastation to many homes, properties, businesses and people. Jose and his team were determined to help their local community by offering up their experience in handling insurance claims. So Bizink’s content writers added information about their Public Adjuster Services to the site as well. The website features a mobile-friendly design, useful business resources, and a library of blogs provided by Bizink. Bizink proudly works with accountants and bookkeepers across the world like JN CPA & Advisors. If you’d like to find out how Bizink can help you become incredible online, book a one-on-one demo with our web team.